Jake Roberge kicks the ball upfield. The junior defender and the Wildcats fell to No. 1 Indiana on Sunday. Northwestern lost its sixth consecutive game, and its third in Big Ten play, Sunday afternoon at home against No. 1 Indiana. The undefeated Hoosiers (5-0-2, 1-0-2 Big Ten) dominated the Wildcats (1-6, 0-3) en route to a 2-0 victory in front of NU’s largest home crowd this year, which included the NU Drumline and players’ families. Despite the home support, coach Tim Lenahan was upset with his team’s lack of energy against the top team in the country. The Cats offense has struggled during their six-game losing streak, scoring just twice during the skid. Sophomore forward Ty Seager attributed the scoring struggles to difficulty finishing opportunities. 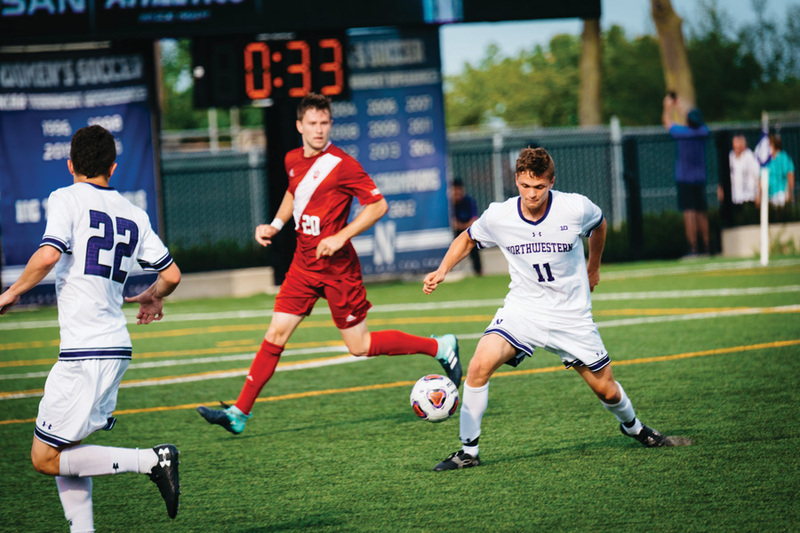 NU could not convert on any of its eight shots, with the Cats’ best opportunity coming in the 53rd minute of a 1-0 game when junior midfielder Emmett Gordon fired a shot just inches wide of goal. Indiana quickly doubled its lead in the 64th minute to put the game out of reach. NU has been outscored 14-4 in its first seven games this year, but may have found an improvement at goalkeeper with freshman Miha Miskovic. He has played all 90 minutes in the Cats’ last four games, tallying up 16 saves since replacing senior Francisco Tomasino as the starter. Miskovic, a Chicago Fire academy product, tied his career high for saves against Indiana with five, including a 1-on-1 stop against Indiana forward Griffin Dorsey in the 79th minute. NU next plays Wednesday at Martin Stadium versus Illinois-Chicago (1-4-1), a break from its difficult Big Ten schedule. The Cats then leave Evanston for a three-game road trip against a trio of top-20 opponents. This article was updated to clarify that the NU Drumline performed at the game without the Northwestern University Marching Band.